​the moment of conception--when life begins-- until birth. Life begins at conception--the moment when the egg is fertilized by the sperm. On this point, there is consensus in science, medicine, and biology. Just 22 days after conception the heart begins to beat. By twenty-eight days arm and leg buds begin to form. At 30 days the unborn child has multiplied in size ten thousand times, has a brain, and has blood flowing through his veins. At 40 days, brain waves can be recorded. 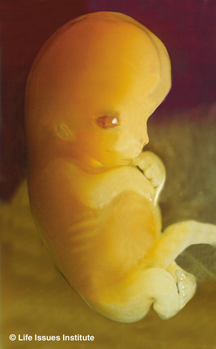 Just 42 days into life, the unborn child's skeleton is formed and his brain controls muscle and organ movements. At eight weeks fingerprints are detectable, hands and feet are almost completely formed, and the fingers are developed to grasp an instrument. 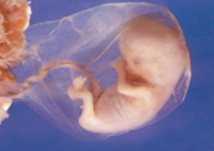 At 12 weeks, all body systems and vital organs are formed. The unborn, now about three-and-one-half inches long, breathes (fluid) swallows, digests, urinates, has tiny liquid bowel movements, sleeps, has dream patterns, feels pain from touch and heat, and reacts to light and noise. And yet, it is during this period of torrid development that abortionists most often introduce surgical instruments into the womb in a deadly attempt to dismember children nestled securely inside their mothers. Gleaming stainless steel curettes and high-powered suction tubes dispatch the little ones who can only grimace and draw back as their suddenly accelerated heartbeat just as suddenly stops. During the first three months of pregnancy, abortionists use "suction evacuation" to dismember and pull the unborn child from his mother's womb. After 12 weeks, a dilatation and evacuation, (D&E), is performed. The cervix is dilated to allow the abortionist to insert forceps to, once again, dismember the child and remove his body parts from the womb. The abortionist must reassemble all body parts to ensure complete removal, lest infection set in. After twenty weeks, abortionists sometimes employ the partial-birth method of abortion in which the child is breech delivered, then dispatched by a puncture wound to the base of the skull. The brain is suctioned and the abortionist withdraws the dead child. Here in Broward, abortionists took the lives of some 11,000 children in 2017. That’s 30 a day, and it’s all legal, or so the U.S. Supreme Court said on January 22, 1973, when it ruled that children not yet born are not persons under the law. But that’s not what God says. “Thou shalt not murder” forbids shedding innocent blood, whether born or unborn. And it underscores why all of us must act on behalf of these “fearfully and wonderfully made” children, as well as offer the compassion of Christ to post-abortive mothers who desperately need God’s forgiveness and healing. You can make a difference. It begins with prayer—ask God to restore legal protection to unborn children. It continues as you speak out—tell friends and family the truth that abortion stops a beating heart and crushes a mother’s heart. And don’t forget to vote—send a pro-life message at the ballot box. Finally, give—share your volunteer time and your treasure with crisis pregnancy centers and pro-life educational groups. At 30 days the unborn child has multiplied in size ten thousand times, has a brain, and has blood flowing through his veins. At 12 weeks, all body systems and vital organs are formed.